Powers/Abilities: Dara possesses no special abilities besides those held by typical Atlanteans. History: (Namor I#36/2 (fb) - BTS) - Dara and Seth were born twins in the House of Thakorr, possessing royal blood. As Namor's cousins, they became his closest friends and were much loved by the people. (Sub-Mariner I#21 - BTS) - Seth was believed killed. (Namor I#36/2 (fb) - BTS) - Dara became co-regent of Atlantis with Vashti, and was to act as Namor's eyes and ears. (Alpha Flight I#14 (fb) (BTS)) - Dara sent word through Ramin that he had returned from his embarkation to negotiate with the United Nations and was prepared to inform Namor of the results. Ramin took word that Dara would have to wait until Namor returned from a mission. (Sub-Mariner II#1) - Lord Dara interrupted a meeting between Namor and the Council of Three (Vashti, Shakkoth, and Thakos) to let Namor know that Dara was ready to depart on the United Nations mission. Namor shocked them by announcing that he would be journeying to the surface in Dara's place. When the Council reminded him of an Atlantean rebellion far from the city, Namor reminded them that Jakka had been sent to investigate. While Namor was gone, Dragonrider, astride a great undersea dragon, devastated the city of Atlantis, leaving it in ruins and many devastated. (Sub-Mariner II#2) - When Namor returned and viewed the devastation wrought on the city, Dara grew furious and blamed the attack on Namor's absence before collapsing from loss of blood. (Sub-Mariner II#3 (fb)) - When Namor prepared to rush off to the surface on another personal mission, Dara and the Council of Three told Namor that he needed to remain or there would be dire consequences. Namor shoved them aside, accusing them of treason. (Sub-Mariner II#3) - Dara attended an Atlantean court that decided Namor was no longer fit to rule Atlantis. (Sub-Mariner II#4) - Dara volunteered before the Council of Elders to inform Namor of the Council's decisions. When Namor returned to Atlantis, Dara delivered the news, and Namor departed the city. 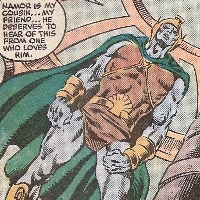 (Namor I#33 BTS) - Seth mysteriously turned up alive and was found by sentries from Atlantis. (Namor I#35 (fb) - BTS) - Seth returned to Atlantis and remained unconscious (or perhaps comatose) in the medical ward. The city was shocked to see Fen, former princess of Atlantis, seemingly resurrected and returned to them. (Fen was secretly Artys-Gran of the Old Ones). (Namor I#35) - When Namor and Vashti returned to Atlantis, the guards told them they needed 'Fen's' permission to enter the city. 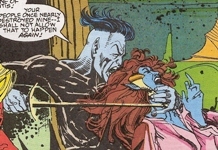 Fen and Dara approached and Dara tried to explain things to Namor before 'Fen' silenced him. When Tiger Shark attacked the gates, Dara went to investigate with Vashti as Namor battled Tiger Shark. Tamara Rahn greeted them both, letting them know she was there with Tiger Shark, then broke up the battle. After Tamara said that she sensed a great evil, 'Fen' approached and discounted that. Dara noted the oddity of having 'Fen' and Seth both show up alive, then Seth swam out to them, reawakened. (Namor I#36) - Dara listened as Seth explained what had happened to him while he was thought dead. Seth had been captured by the Faceless Ones for years, eventually escaping. Namor grew accusing against the incongruity of 'Fen's' story. (Namor I#37) - As Namor took a group to investigate the mysteries surrounding Seth's captivity, Dara and Vashti remained in Atlantis to keep the secret from 'Fen.' 'Fen' approached them suspiciously, and ordered the children of Atlantis be gathered to the citadel for a feast the next day. (Namor I#38) - As Vashti left to retrieve Namor, Dara had the children gathered. When 'Fen' cried out in her sleep, he tried to convince her she was not well. She looked over the gathered children happily, and Dara lied to her about Vashti's whereabouts. When Leviathans attacked the gates, Dara tried to rally the people but was silenced by 'Fen.' Fen took a child and moved back into the temple. (Namor I#39) - Before the people, 'Fen' prepared to sacrifice the child, despite Dara's protestations. Tamara Rahn and Tiger Shark returned and Tamara snatched the child from under the blade, proclaiming that 'Fen' was really Artys-Gran. When Fen didn't deny it, Dara grew furious and took a blade to Artys-Gran's throat. The Atlanteans were bewitched, however, and an Atlantean woman from the crowd threw a spear that impaled Dara and killed him. Dara's death fulfilled a prophecy and the Old Ones entered the city. (Namor I#40) - Namor and his allies defeated the Old Ones. Seth, particularly, was distraught over Dara's death. Comments: Created by JM DeMatteis, Bob Budiansky and Danny Bulanadi. Dara received an entry in Vashti's journal in Namor I#36. (Alpha Flight I#14) - As a chamberlain in Atlantis, Ramin brought word to Namor that Dara had returned from his negotiations with the United Nations. When Namor left on a mission, Ramin was sent back to tell Dara that Namor would meet with Dara later.